4 Corner IT understands your business, not just your technology. Aside from an extremely responsive and friendly first-call resolution help desk, a forward thinking, methodical proactive team, and a brilliant project engineering team, we pride ourselves in understanding your business. We want to first learn the current workflow of your company, and then move on to presenting or demonstrating products that can create the efficiencies needed to strengthen your business. Since 2000 we have been providing managed services to the Tri-County area, offering top notch IT Support and Management, as well as detail-oriented Project Deployment plans. Our comprehensive services list features all the tools and coverage needed for any business allowing you the flexibility to grow. 4 Corner IT has seen smaller businesses flourish and thanks to experience with larger organizations, small business has the advantage of attention to detail, with an enterprise level of support. From home offices to office buildings, 4 Corner IT has your back. 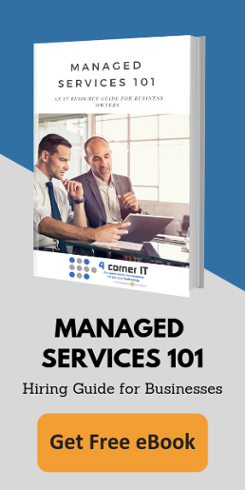 The managed services industry is a saturated market, over flowing with competition, making it almost impossible to choose the right company in a sea of uncertainty. 4 Corner IT offers a free consultation to demonstrate our company’s ability to accommodate even the most complex networks and configurations. Our highly qualified technicians have spent years at their trade, perfecting their craft, allowing us to provide knowledgeable advice and insight to our clients. We are constantly testing and researching new products that promise productivity, so our staff is constantly ahead of the game, taking the bumps in the road before your company learns new products, the hard way. Why Choose 4 Corner IT? 4 Corner IT simply has the experience with the most diverse clients, networks, and different size organizations. Since day one, we have remained on the cutting-edge of technology, offering the most advanced applications and hardware possible. It’s no wonder that 4 Corner IT has remained a corner stone and original pioneer in the managed services industry, our drive for the latest advances to offer to our customers to improve work flow. We have grown beyond the “computer and server repair only” and have moved on to the proactive management and consulting aspect of IT. Software implementation and/or software as a service (SaaS). Disaster recovery planning and cyber liability risk assessment. Training and optimization on their software and systems investment to ensure its success. Our sales meetings speak less about us and more about you! We are not afraid to give you an hour or two of our time to show you why and how there is always an opportunity for improving your technological foundation. With the emergence of cloud technology those opportunities are more abundant than ever before! You need a partner that ensures your success, not a run of the mill computer guy or IT Company benefiting from your problems. We are that next level for your company but you need to allow us to sit with you to show you the why and how. Find out how we use technology to keep our business running efficiently, which helps reduce our costs which in turn make our offerings affordable and attractive to you. We are South Florida’s premier IT service provider servicing Miami, Broward, and Palm Beach counties located in Fort Lauderdale.